Henceforth you were restarting Apple iPhone, iPad and iPod Touch. Now even you might looking for a unique trick and it is, how to Restart Apple Watch. Restarting the device is a remedy of almost major problems. 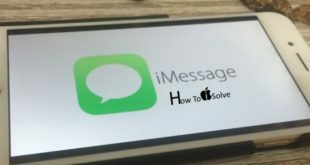 For instance, Apple Watch; if Apple Watch frozen after update, Apple watch apps often crashes, if Apple watch stuck on logo, get Apple watch touch unresponsive and much more issue. We recommend you that, if you will get ever above kinds of issues, please you should follow below-given steps for Restart Apple Watch. Apple watch has comes with only two buttons one is Digital crown and remain is turn on/turn off button. We hope underneath given commands through you would become master to Restart Apple Watch. Step 1. Grip your Apple Watch comfortably. Step 2. Press and hold on Side button until you see the Power off slider. Step 3. Now, Drag the slider off side to make your Apple Watch completely off. Step 4. Let now, follow same steps again to turn on your Apple watch. If you cannot understand – Press and Hold Apple watch side button until your see Apple logo. While your Apple Watch is not responding and after tried Restart Apple watch. 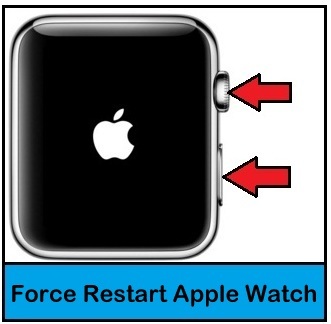 If you get same issue then you should follow Force Restart Apple Watch. Force Restart iPhone and Apple watch both happens similar way just buttons look is different. 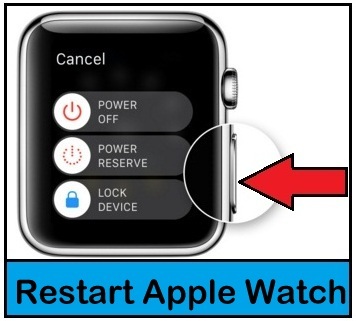 Go with below Instructions to perform Apple Watch hard restart. Step 1. Press and hold both the Digital Crown and the Side button simultaneously for at least 10 seconds, until you see the Apple logo. Step 2. Now to turn Apple Watch, follow same step until you get Apple logo on Apple watch screen. Having any problem during the Restart Apple Watch or hard restart Apple iwatch? Please don’t hesitate; just leave your speech in the comment box. We will give you reply as soon as possible.